All around the world men and women face the challenge of communication with people who speak a different language. Enormous sums are spent on foreign-language education and on interpreters and translators. Unfortunately translators frequently mistranslate and the vast majority of those who spend years studying a foreign language never reach the point where they are able to read a newspaper article or carry on a normal conversation as they can in their native tongue. 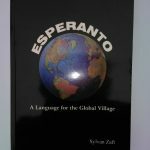 In Esperanto: A Language for the Global Village, Sylvan Zaft discusses a proposed solution, a language which was planned to be learned in months instead of years. He discusses the features of Esperanto which make it much easier to learn than national languages, and he describes the rich international culture and literature that has been created by the relatively small but vibrant worldwide Esperanto-speaking community. LUDU kaj LERNU is a series of card games which can be used to teach and learn Esperanto. The games require players to ask and answer questions while searching for pairs of cards similar to the popular children’s game “Fish”. In the first game, one card of each pair has a question the second has the answer. In learning how to play, students will learn 92 Esperanto vocabulary items from the Esperanto Antaŭen Basic List. Playing the game reinforces the students memory of the 92 Esperanto vocabulary items which they have learned. The second game is similar to the first except that in the second game one card of each pair has two questions, the second card of the pair has two answers. The 92 vocabulary items from the first game are also used in the second game. An additional 92 vocabulary items are introduced. Playing the game reinforces the students memory of the 184 Esperanto vocabulary items which they will use while playing. Each game is available in two versions. One version is for teaching with spoken and written exercises for students prior to playing for the first time. The second version is just the cards and “helpiloj” (sheets intended to help players with the conversation required in searching for pairs). An additional 3 games are planned. Together the five games which will introduce and reinforce memory of the 452 vocabulary items on the Esperanto Antaŭen Basic List.